I think you get the idea. Just like the American Express slogan says, “Don’t leave home without it.” In this case, I’m referring to your business card. Generally speaking, it’s an inexpensive way to get your name and brand out there, market yourself, stay in front of clients, and quite frankly, look professional. Here’s Joel Bauer’s take on business cards. Love him or hate him, he’s got his opinions. This comes to you courtesy of Matt Arndt at Turbo Social Media. 4. Think outside the business card box. What are you doing to get noticed…or at least your card? Whether it’s throwing your card into a bowl for a prize drawing, pinning it to a bulletin board, partnering with someone who can get it to the right people, mailing it to a distribution list, leaving it with a tip at a restaurant (if your in that business)…. You get the idea. Joel Bauer’s business card is $4. Yours doesn’t have to be. Most are just pennies each. But if you’re so inclined, perhaps you can have two – the fancy one for important clients/occasions and a less expensive one for others. Just a thought. Remember, make sure, after a meeting, you jot down some notes on the card you received, so that you’ll remember the conversation later. Don’t write on the card in front of the person, as they might take offense to it. As for your card, you can write additional information on it, before you hand it over, leave it behind or mail it out. This tends to increase the likelihood of it being kept. If you’re interested in a consultation, for more information, please refer to Behind the Scenes Consulting. If you have questions, please email me at Robert@RobertFinkelstein.com. If you have any comments, please write them below. Thank you. Back to business…and business cards. I can’t stress enough the importance of having a card. You know the old saying, “Out of sight, out of mind.” Well, a business card can make sure that doesn’t happen. Personally, I have so many cards I’ve collected over the years. Granted I put the contact’s information into my Outlook, which I sync with my iPhone, so I’ve got everyone with me all the time…but I don’t throw out the cards. It’s my old fashion backup. I wouldn’t be surprised if most of you do the same thing. Get your card, and a few extras, into their hands…and keep you on their minds. If you’re interested in a consultation, for more information, please refer to my Behind the Scenes Consulting. If you have questions, please email me at Robert@RobertFinkelstein.com. If you have any comments, please write them below. Thank you. It’s been a few days since my first blog on the subject of how best to use your business card. Never underestimate the power of the little card and whose hands yours might end up in. Like I mentioned last time, there’s no good excuse to not have one. Although it might be obvious, I’m going to suggest some great opportunities to circulate you card. 2. The more the merrier. Regardless of your business, you need to be out there, networking and spreading the word. For starters, social meetings and mixers are good places to meet people…who could be potential clients, customers or referrals. Have the cards ready. 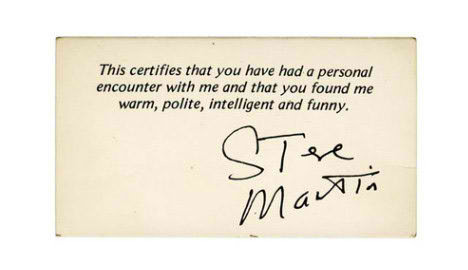 If you’re meeting someone one-on-one, the card comes out. And consider giving more than one. See if they’ll pass the extra one along to someone who might need your services. Trade shows and conventions are a haven for card swapping. They want yours as much as you want theirs. Don’t forget, it’s always a good idea to jot down a few memorable notes about those you meet. When you get back to your office with a stack of cards you acquired, good luck remembering who’s who if you don’t. Another great way to get your card circulating is through non-competing businesses. If you own a brick and mortar, see if they’ll support you and vice versa. Their customers can become yours. It’s a win-win. And finally, if you travel internationally, consider a card printed on both sides, one English, and one in the other language. It will be appreciated and respected. If you’re interested in a consultation or have questions, please email me at Robert@RobertFinkelstein.com. If you have any comments, please write them below. Your business card still remains one of the best marketing tools out there. Whatever it is you do or want to do, have a card made. With companies like Vista Print making business card for pennies, there’s no good excuse. In the next few blogs, I’ll provide reasons and ways to get your card working for you. As you know, your card does the obvious. It let’s people know your name and the name of your business, if you have one. It provides prospects with a way to contact you. It can tell them what you do or what your vision is. Depending upon how you design your card, you might show a piece of your personality and style. You can be creative and make your card stand out from the traditional black and white ones. And if you’re lucky, it can get passed from one person to another, allowing your name and information to hit more prospects. Keep in mind, glossy cards generally cannot be written on and don’t allow the recipient to jot down any notes about your meeting. Not such a good idea. Let’s look at some of the best ways of using your business card. 1. Don’t leave home (or your office) without it. Make sure that you’re always carrying your cards. Any time you have a one-on-one meeting, whether it’s someone you’ve never met or someone you haven’t seen in a long time, give them your card. And have more than one. You never know if they’ll be an extra person attending. There’s also the opportunity to have them pass your cards along to someone else. Of course it goes without saying, but I will anyway, have plenty of cards at social and networking events. You always to want to build your business network, and a business card is about as easy a way as there is.